Nowadays radio is one of the most popular mass media. When you are at the wheel, you are listening to the radio. When you are cycling, you are also listening to the radio. And when you are working, radio is also with you. 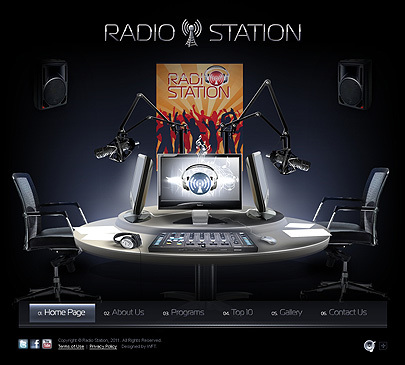 Most of popular radiostations have their own webpages, where fans can read all news, listen to the most popular tracks and get acquainted with DJs. Now you can enhance your site with our Radio Station flash template. Record room is the central part of our template. The title is emphasized by the Wireless Network icon. Microphones, monitors, headphones and poster deliver the atmosphere of radio studio. Menu items are animated and designed in the style of buttons, not to break the atmosphere of radio station. When click on menu entry, the pop-up window with its content appears. The content can be scrolled and enlarged by “Read more”. All elements are located in compact way, so that you have all necessary content at hand. With our flash templates you certainly receive unique idea and design, high quality and professionalism. how I can add shoutcast radio? do have template for shoutcast radio? You should edit source file and add script for your live radio. No. We can do it for you for additional fee.